Sophisticated travelers often rank San Francisco, Cape Town and Sidney as the most beautiful cities in the world. From the hilly neighborhoods dotted with peach, yellow, and lime-colored wooden homes to the colorful waterfront, Cape Town can confidently accept this praise. An excellent climate, friendly folk, beaches stretching forever, swooping seagulls and sun-kissed surfers make Cape Town the country’s most vibrant city. Table Mountain, towering 3,500-feet above the city of 3 million, is the symbol of Cape Town, like Statue of Liberty for New York City, Big Ben for London, and the Eiffel Tower for Paris. South Africa’s legislative capital and oldest city boast top-rated hotels, internationally ranked restaurants, boutique shopping trendy wine bars and a night life that never stops. Jazz clubs swing with the multi-cultural sounds of Cape Jazz, distinctive for its Latin, Africa and Malay influences. Victoria & Alfred Waterfront: This entertainment district overflows with pubs, restaurants, clubs, art galleries, museums and night life. Dedicated shoppers will enjoy the shopping mall and crafts centers. The waterfront offers boating excursions, two movie theaters, an IMAX theater, and the Two Oceans Aquarium. Robben Island: South Africa’s Alcatraz is a former prison perched on limestone rock in Table Bay where Nelson Mandela was incarcerated for almost twenty years. Robben Island, a World Heritage Site and National Park, is a “must see” to learn about apartheid. You’ll need to take a ferry from Victoria and Albert Waterfront. Tours are led by former prisoners who were part of the struggle against apartheid. Table Mountain: As the sun sets over the continent of Africa, Table Mountain reflects a red glow. The top can be reached by a hiking trail or a revolving cable car. Miles of trails cover the plateau and offer incredible views of the suburbs, bays and the sparkling sea. Visit early in the day before the clouds move in or go at sunset to avoid the crowds. Kirstenbosch Gardens: If you love flowers or gardening, don’t miss this World Heritage Site, showcasing an enormous variety of South African plants, trees, flowers, vegetable, and succulents. A free docent tour is offered at 10 a.m. daily. The docent guide will explain plants, species and medicinal uses for the plants as she leads you through the manicured gardens, sculpture garden, and fragrance garden. Bascule Whiskey Bar – A Cape Town Hotspot! A five minute walk from the heart of Cape Town’s shops, markets, art galleries and museums, this trendy whisky bar and wine cellar is the place to rub elbows with relaxed young professionals after work. On nice days dozens of good-looking men and attractive women sip wine, beer and whiskey under the umbrellas on the outside patio overlooking mega yachts. The nautically decorated Bascule Bar is located in the Cape Grace Hotel. Over 400 malt whiskies from every producing region including Scotland, Ireland, USA, Canada, India, and Japan are served from the long, oak bar. The walls display rare whiskies, including a 50-year-old bottle from Glenfiddich, a 35-year-old bottle of Springbank, and more. The wine collection features world-renown Cape wines and the people watching can’t be beat. Whether under the sun with moored yachts or enveloped in dark wood and warm maritime comfort, Bascule is the “in” meeting place to unwind. Cape Town is the place for a cross cultural food experience. The country’s rainbow culture has produced a natural fusion cuisine with enough variety and spice to satisfy any visitor. Black Africans had (and have) a healthy diet of game, fish, root vegetables, wild greens, berried, millet, sorghum and maiz. Sugar farmers brought indentured laborers from India to cut the cane, and with them they brought the distinctive cuisine of India. The British and German immigrants added European embellishments to South African fare. Workers from Malaysia brought their own dishes – all using a generous sprinkle of spices. Malay slaves brought their spicy and flavorful cuisine. French Huguenots arrived after the Dutch and introduced the vineyards that began South Africa’s love affair with fine wine. Ask where you can have a typical Cape Malay or Zulu meal. One Market: Judging from the crowd of regulars who cram One Market, an elegant waterfront restaurant, this is the place to go for creative cuisine and intimate dining infused with distinctly South African flavors. Don’t miss the wild Caesar salad with three cured carpaccios of warthog, ostrich and springbok, served with toasted garlic and roasted pistachio chips. The fresh culinary ideas are balanced with flavor and the passion of Chef Bruce Robertson and his team. After your meal compliment your palate with lingering vintages and indulge in the dessert chocolate and wine pairing. Rock Salt Dark Chocolate is paired with Cabernet Sauvignon. The Masala Dark Chocolate compliments the spiciness of Shiraz wine. But best of all is the Rose Geranium Milk Chocolate that mimics the sweet raison and vanilla flavor of Muscat. Winemaker Kevin Arnold and the Chocolatier Richard Von Gensau created this experience. Epicurean dining at an elegant restaurant is part of the Cape Town’s attraction. The Accommodations Are Also Extraordinary! 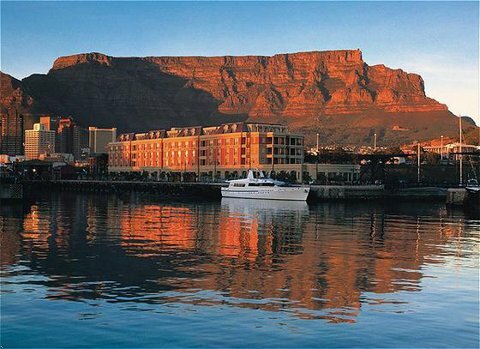 Cape Grace was voted “Best Hotel in the World” by Conde Nast Traveler in 2000 and the awards have kept on coming. Located on the picturesque Victoria and Alfred Waterfront, this Leading Hotel of the World has long been the choice for honeymooners and sophisticated travelers seeking comfort and luxury. In addition to the expected luxuries, the Cape Grace has a fabulous spa that combines understated elegance with treatments that hark back to ancient Africa – when massage and aromatic spices were used to cure a thousand ills. The Spa, as well as rooms at the Cape Grace enjoy views of Table Mountain to the south or Victoria and Alfred Waterfront and the Indian Ocean to the north. Eric and Lente Schwartz, of Belvedere have deep roots in the Constantia Valley, the Cape’s oldest wine farming area. Lente’s family (the Louw’s) owned the Steenberg estate for three generations. 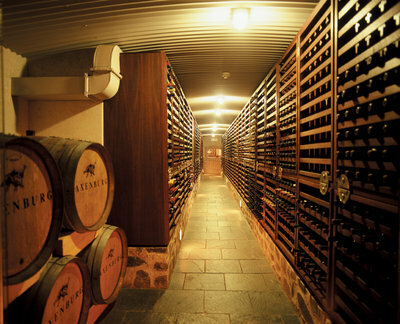 Steenberg, the oldest wine estate, and a five star hotel, still produces award-winning wines. It’s a short 20 minute drive from Cape Town surrounded by pristine vineyards and nestled at the foot of the imposing Steenberg Mountains. The buildings which date back to 1682, have been lovingly restored to their former glory and each has been declared a National Historical monument. And an 18-hole championship golf course designed by Peter Matkowitz follows the natural contours of the original farm. The property’s first owner, Catharina Ustings, arrived in the Cape in 1662 from Germany, purchasing the estate in 1682. She was first woman and this was the first farm to be given title in South Africa. Catharina was one of the most daring and controversial figures to ever settle in the Cape. One of her five husbands was killed by a lion and legend has it that Catharina hunted the lion on horseback and shot it. The property is situated in the Constantia Valley, the Cape’s oldest wine farming area, particularly famous for its white wines, due to the cool breezes from False Bay. The flagship Sauvignon Blanc Reserve has won a number of awards worldwide, and Steenberg’s red ‘Catharina’ blend is highly recommended for its elegant French feel. Take time for a guided tour and wine tasting, and treat yourself to a Ginkgo “Elixer” Massage at the spa. The Catarina restaurant won awards for its contemporary South African Cuisine, including the American Express Platinum Award for Fine Dining. Dozens of old wineries are located an hour east of Cape Town in the historic wine region grouped in a triangle around Stellenbosch, Franschoek and Paal. You can do wine tours by bicycle, (there are wide shoulders on the roads for bikers’ safety) or on horseback or spend a day with the wine farmer, the wine maker, and the chef to enjoy a tasting paired with local organic food in the owner’s manor house. For the discerning guest who wants to visit a winery privately, stop at Vielliera, a family-owned little gem that no large groups or tourist buses visit. Try the Monro, a four star flagship wine with a well-structured palate, unobtrusive with a plumy and chocolate taste. Monro wines are a blend of Merlot and Cabernet Sauvignon. Hoopenburg is a vineyard famous for its Sauvignon Blanc, selected by South African Airlines for serving to all classes of travelers. Le Bonheur, is located off a quiet back road, at the end of a gravel driveway. The estate, built by a French Architect, is surrounded by a white picket fence and weeping willow trees. You’ll be welcomed by the sweet heady fragrance of French Jasmine as you relax at tasting tables on oriental carpets set among French armoires. Like most of the vineyards, they don’t know what to do if a vehicle arrives with more than four guests. For More Information, please consult the South African Tourist Office 212-730-2929.